No-mess painting for kids! 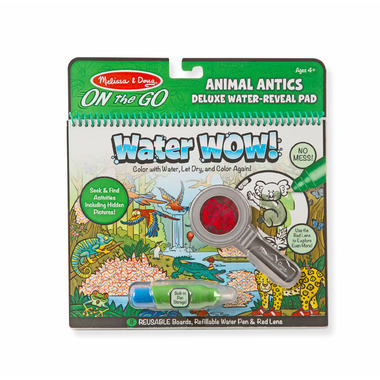 This exciting paint-with-water and seek-and-find activity book includes eight reusable pages, a refillable water pen, and red lens. Simply use the pen to colour in each animal scene—details and vibrant colour appear with every stroke! Let the page dry to erase the pictures and color it in again and again. Reveal hidden pictures with the water pen, then use the red lens to explore even more in the detailed scenes! The chunky-sized water pen and red lens are easy for kids to hold and store neatly right in the front cover, making this Deluxe Water WOW! an ideal travel activity book and travel toy for kids! Product Description: 10.5 x 10 x 0.9"